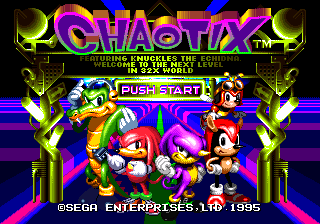 Back to: Chaotix (prototype 1207). The Sega logo is displayed over an image of Carnival Island. A higher resolution version appears in the game's manuals, but is never in-game in the final version. Welcome to the next level in Super 32X world. No characters can be seen on the title screen, and they're not even referenced in text. Start a new game and you'll be presented with the "data load" screen. It has yet to receive a background, and the controls are reversed. The Amazing Arena, Techno Tower and Marina Madness are ordered differently in the final game. There are one and two player options from the main menu, but both lead to the same place. The 1207 prototype also has a "Time Attack" option. It lets you pick a character, an NPC partner and a level, but the in-game rules are the same as always. The character select screen scales sprites, but due to the scale values chosen, characters are more likely than not to look pixelated and ugly. The "option" screen by default is a basic sound test, represented solely by four hexadecimal digits. You have to hold , or when selecting it from the title screen to access other features. Hold while selecting "option" and you'll see the colour test screen. Perhaps not surprising that the Mars number is red. Hold and you get a more detailed sound test. It functions like the final game, but there aren't any graphics to speak of yet. The notes and volume levels are represented by white lines, but it appears to be accurate. The "normal" level select is also available from main menu. There are a couple of options here not seen in the final game, such as being able to set it so your partner can't jump. There are a couple of errors in the title cards. Heavy is called "Heaby" and the game is still referring to itself as Knuckles' Ring Star. In the final game, the stars connecting the two combi rings change colour depending on distance, being blue if the characters are close, and moving through the spectrum to red when they're at their limits. In the 1207 prototype, the stars are always blue. Calling your partner with causes the smaller player-controlled sprite to overlap the larger, NPC sprite, rather than the other way around. This page was last edited on 20 April 2018, at 12:02.